Please complete the form below or call us at +1 512 522 7748. We’ll respond to your inquiry shortly. Thanks for your interest! 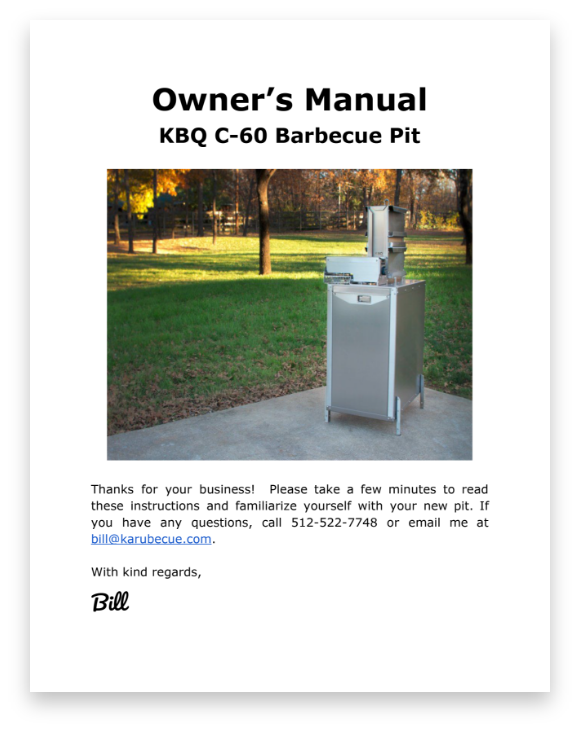 We occasionally sell blemished, fully-warrantied pits for a small discount but try really hard to avoid those mistakes. There are always a number of ideas in development, but to be implemented they must outperform the current version, considering reliability, performance, and cost. That has proven to be a formidable hurdle. Do you ship outside of the Lower 48 United States? We ship to the US location of your freight forwarder. You arrange the freight and manage the paperwork, duty, etc. We’ve had good luck with ipsparcel.com and shipito.com but there are many to choose from. Box 1 of 2 is 29x21x29″ and 56 lbs. Box 2 of 2 is 25x17x14″ and 58 lbs. Where can I find wood to fit the Firebox? The best approach is finding a local source, such as a tree service or firewood supplier, and reducing it yourself with a chop-saw or chainsaw to crosscut and an axe or Kindling Cracker XL to split. What is the right kind of wood? The best species are dense hardwoods such as oaks, hickory, and mesquite. Avoid kiln-dried and freshly-cut wood; split and air-dried for 3-12 months is ideal, having a moisture content of 20-30%. How often will I need to tend the Firebox? About twice per hour. More frequently for smaller/drier logs and less frequently for larger/wetter ones. Can you make a bigger Firebox? Sure, but it wouldn’t do any good, as all fuel in the Firebox heats and burns on the same 30-minute timeline. If you don’t want to tend, don’t buy a stickburner! Will the KBQ cook faster than my offset? The convection flow typically reduces cook times by 20-25%. Should I put a KBQ on my wood deck, houseboat, or daycare playground? Should I use the Firebox Lid? YES! It reduces fuel consumption, limits sparking, and improves flavor and bark. Why am I struggling to get up to temperature? If you can see the zigzag holes in the Coal Tray through the Firebox’s side slot vents, your coalbed is too thin. Run the Firebox fuller so wood has more time to decompose to coals. Why am I consuming so much wood? You’re running the Firebox too full for your smaller and/or drier fuel. How do I read the knob on the Controlbox? How can I reduce the fly ash on my food? Wait for the draft fan to cycle-off before fluffing the fire and adding fuel. A $5 grounded plug switch on the Controlbox helps if you don’t like waiting. Worry not! We’ve got you covered. Download your new copy either by PDF or Google Docs and so you can have it on you whenever and wherever.